Simone Martini was a famous Italian painter who was born in Siena. Much of the information we have on Martini comes from piecing together bits and pieces of folklore with historical records. For example, his death date was found among the official records of Siena and Giorgio Vasari's (1511-1574) statements that Simone's epitaph said he died at the age of sixty. Using those two pieces of information, scholars believe that Martini was born around 1284. Throughout history, it has been debated whether Martini was a student of Giotto or Duccio di Buoninsegna. Another biography suggested that he may have studied under the mosaicist Jacopo da Torrita. Depending upon the scholar, both are equally defended but it seemed to me that Duccio is the preferred choice. Personally, I would rather focus on Martini's work than debate who might have been his tutor because at the end of the day, we will be talking about Martini's paintings. Like so many artists of this period, too much research can lead to contradictions. What one scholar attributes to a virtually unknown artist named Mino, is attributed by others to Martini. One article identified the famous fresco at the Palazzo Publico of Siena as being the work of Mina in 1287. Others identify it as one of Martini's earliest works dating from 1315. The beautiful fresco, entitled, Maesta portrays the Madonna and the infant Christ surrounded by saints and angels who are holding a canopy over the throne she is sitting upon. Jesus holds the charter by which the city was bestowed upon the Virgin on the eve of the victory of Mont'-Aperto. His right hand is uplifted as if in the act of blessing. The fresco is painted larger than life size, yet the details are quite finely executed with gold and delicate embroidery on the garments. The border contains armorial bearings including the black and white shield of Siena. One scholar said 1315 was the year Martini painted the work and another lists that as the year he was hired to restore it. 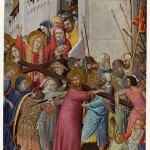 A third source mentioned Martini was paid 25 lire to retouch the fresco in 1321. It would seem that Martini definitely laid paint on this fresco but it seems a bit unclear as to which layers are his. Martini married the artist Felippo (Lippo) Memmi's sister, Giovanna, in 1324 which unfortunately led to even more confusion for historians. While many believe that Martini was assisted by his brother in his work, his brother-in-law is unfortunately named by some as that assistant. Some historical works actually incorrectly refer to him as Simone Memmi. Most paintings of this era were commissioned by and for the church. Very few, if any, paintings were pastoral landscapes or depicted non-Biblical themes. In 1328, Simone Martini painted what is believed to be the earliest equestrian portrait known in Italian art. It was of the Sienese chieftain Guido Riccio and depicted Siena and the siege of Montemassi. This fresco also appears on the wall of the Council Hall in the Palazzo Publico at Siena. This painting is historically important as it marks the beginning of Individualism in painting. With Giotto no longer available, Pope Benedict XII summoned Simone Martini to the Papal court at Avignon to adorn his Cathedral and his Palace sometime in 1338 or 1339. Martini is thought to have been one of the most well-thought of artists at this time and was considered second, only to Giotto. With Giotto's death, we can only assume that the Pope now considered Martini to be the most talented artist in Italy. Sadly, many of these works were not well-maintained. Martini signed his works Symon de Senis and Symon Martini. He was friends with Petrarch and his lost painting Laura inspired two of Petrarch's sonnets. Sienese records list that Simone Martini died on August 4, 1344 but it is unclear if he died in Avignon or Siena. His work is most recognizable for his attention to detail in portraiture. He depicted landscapes in a more realistic fashion than many of his contemporaries and embraced bright colors and fine details.